The main function of the national park is to preserve the nature. concerning the preservation of nature. The National Park as a form of the preservation of nature. Art. 8 (1) of the Act defines national park as the area distinguished by special values of a natural, educational, social, or cultural kind, covering the area not smaller than 1000 ha, where the conservation covers the whole nature and landscape values. Art. 8 (2). National Park is created with the aim of preserving the biological diversity, resources, formations and components of inanimate nature and landscape values, reinstatement of proper condition of natural resources and components, and reinstatement of deformed natural habitats, plant, animal or fungi habitat. Art.12 (1). The area covered by the national park is available for scientific, educational, cultural, tourist, recreational or sport activities unless they do not negatively influence the nature in the national park. Active protection allows human interference, in a form of protective actions aimed at the reinstatement of the condition closest to natural ecosystems and nature components or maintenance of natural habitats , as well as plants, animal, and fungi habitats. The best example of the active protection in Białowieża National Park is mowing and shrubs removing from meadows located in river valleys, midland meadows and areas, which remained after the old wood storehouses in Hwoźna Protective Unit. These are the places where many rare and valuable species of plants appear, inter alia marsh gentian, marsh pea, mat-grass, Succisella inflexa (Kluk) Beck or orchids, and rare bird species (corn crake, common snipe, lesser spotted eagle). Maintenance of an open character of these places requires the stoppage of natural succession, meaning shrubs and trees growing. Proper activities are performed in the summer time, after rare plant species finish to blossom, and when birds finish breeding. Active protection covers the total area of 4104,63 ha (39 % of the Park area). In accordance with the Nature Conservation Act, landscape protection means the preservation of characteristic features of a certain landscape. The landscape of the Palace Park is a great advantage of Białowieża National Park. Tree composistions and meadow systems, covering the vast areas between tree and shrub clusters, are important elements of the aforementioned landscape. In this case, landscape protection means maintenance pruning of trees and shrubs and meadows mowing/scything. In practice, very often lansdcape protection of the part of national park or nature reserve permits the economic use of the area. Such a status is usually given to private grounds within the park or reserve area, and to the technical areas (roads, car parks, buildings etc.). 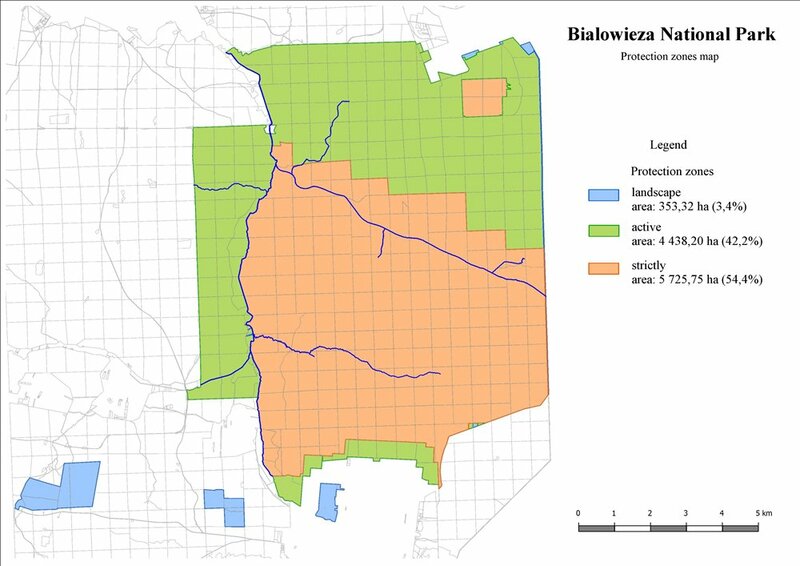 With a regard to Białowieża National Park these are agricultural areas, area of the European Bison Breeding Center, the strip of the cross-border road. The Park was divided into landscape protection zones having total surface area of 353,37 ha (3,4 % of the Park area). The protection zone, commonly known as buffer zone, plays a very significant role in the protection of the park nature. The zone covers the surface area of 3224,26 ha. It serves the purpose of protection of the Park nature against exterior threats, with a special regard to those of an anthropogenic origin. The protection of plant, animal, and fungi species is the form of the protection of nature against the destruction or extinction of rare and valuable species. 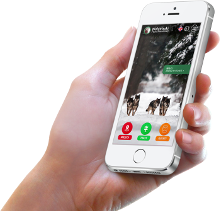 Knowing the position of naturally valuable plant and fungi species, the number, and condition of the population of the protected animal species, we might control the threats and try to fight them in order to preserve given species. Park personnel perform the stock-taking of the protected plant stands. Furthermore, they also take care of preservation the European bison breeding, e.g. they take care of the herd of free European bison within the Polish part of Białowieża Forest and they monitor the herd all the time. The personnel prepares, also, the stock-counting programs referring to large predators: wolf and lynx. - Zamosze (area of 1379,52 ha). - European bison Show Reserve. The duties of the personnel of European bison Breeding Center cover also the restitution breeding of European bison inhabitating all Polish part of Białowieża Forest.